Atlantes, a lost city of intrigue to most, is merman Brutus's home, his curse, his prison. Doomed to an immortal life deep in the ocean, their only chance at salvation is to rescue damsels in distress from the surface world and bring them into the abyss. While mythology may label he and his kind monsters, this warrior is simply a man with needs. And he's found the perfect woman to see to them. 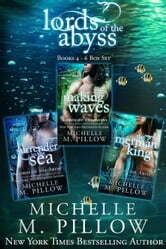 When Demon, a merman tasked with patrolling the ocean for humans in distress, comes across a woman anchored to the bottom of the sea, he’s sure his dreams have come true. After all, she’s stunning, single, and makes his body burn with need. She’s also impetuous, being hunted by his enemies, and seriously conflicted on whether or not he’s a good guy. 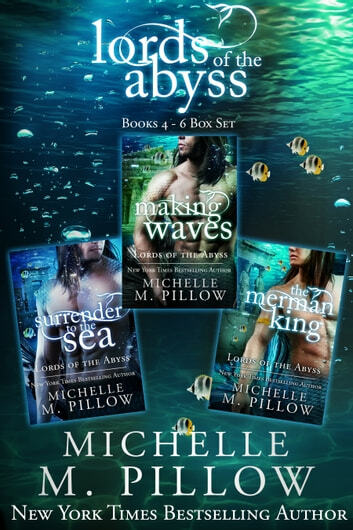 It’s his duty to not only protect her, but to win her heart—because this lonely merman is sure she’s the one for him. Now he just has to convince her. Lucius, King of the Mermen, and ruler of the city of Atlantes, shoulders the guilt for his people’s curse. After being trapped under the sea for two millennia, the time has come for his people to possibly surface and breathe air. He’s ready to be the first to test the theory, but things do not go as expected when a captivating beauty seemingly falls into his lap—and his ocean. Is Olivette a present from the gods, or a warning to stay punished beneath the waves where his people belong?